New leadership has given the Russian Central Bank a fresh dynamism that was sorely lacking. 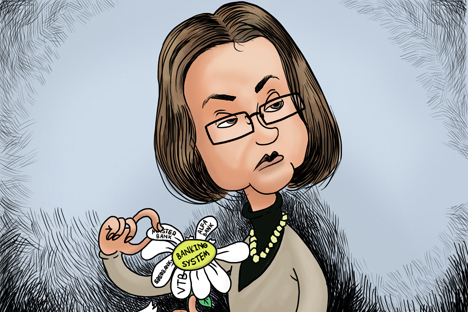 The new head, Elvira Nabiullina, is shaking things up, in part by making inflation Enemy No. 1. We here at the Moscow’s UFS Investment Company welcome the change. In the mid-term at least, we think that targeting inflation should indeed be the priority. This drive will hopefully help win investors’ trust, and ultimately benefit capital markets. If successful, the Russian fixed-income market should rally from its currently low levels. Less than a year into Nabiullina’s appointment, over two dozen banks have been stripped of their licenses as part of a sector-wide cleanup. It took her predecessor, Sergey Ignatyev, over 18 months to do the same. The country’s banking system has been in need of a health check for a long time. The speed with which these events are taking place has provoked a wave of criticism. But while the methods may be up for debate, no one denies that change was necessary. The new leadership has taken equally radical steps with regard to the refinancing system. The set of monetary policy instruments has been simplified, and the number of operations has been cut. One of the most important changes is that the main benchmark tool, the refinancing rate — which did not play a big role under the old guard — has been replaced with the one-week repo rate. That brings us back to inflation, which is the main reason why the new tool, the key rate, hasn’t been reduced in spite of slow growth. Inflation in Russia has been largely driven by non-monetary assets, such as food prices and tariffs charged by natural monopolies. In 2014, those tariffs are planned to stay steady for industrial consumers and to be raised by less than the rate of inflation for households. Consumer prices rose 6.5% in December, compared to a year earlier. For the next three years, the bank set an ambitious goal of gradually bringing inflation down to 4%. Low inflation is one of the conditions necessary for a favorable investment climate. A lack of investment is one of the main problems of the Russian economy, which is today going through a period of structural change. The downside to this approach is the inability to provide a stimulus to economic growth. Yet the bank remains adamant that any easing of the policy would only spur inflation. Stanislav Savinov is a macroeconomic analyst at UFS Investment Company in Moscow.